California billionaire Tom Steyer is getting involved again in Washington politics, sending $80,000 to a 2016 initiative to fight climate change. 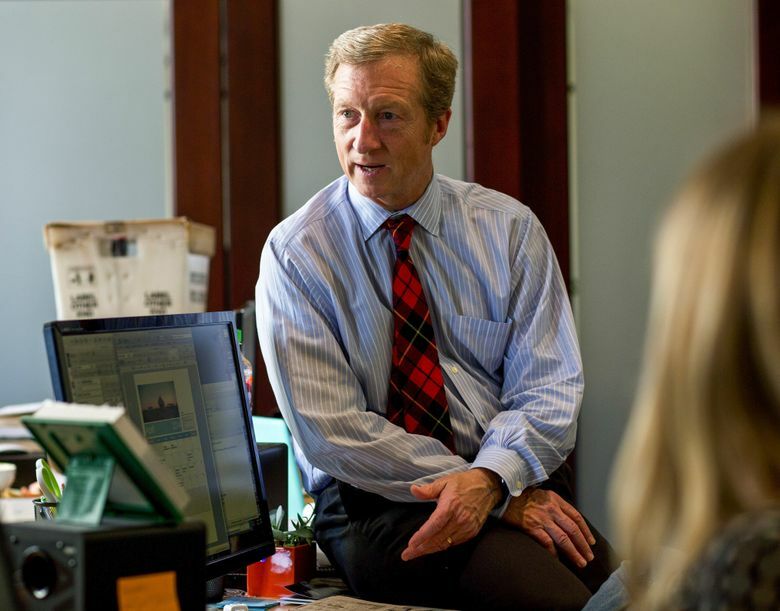 California billionaire Tom Steyer is getting involved again in Washington politics, putting his money behind a planned 2016 ballot initiative to fight global warming. Steyer’s NextGen Climate Action has donated $80,000 to the initiative campaign backed by the Alliance for Jobs and Clean Energy. The donation — the first reported by the initiative campaign — was sent last month and disclosed last week in a filing with the state Public Disclosure Commission. The alliance, a coalition of major environmental groups, unions and social-justice advocates, is working on an initiative that would impose new fees on carbon emissions from fossil fuels. It would devote money raised to clean-energy projects, investment in low-income communities and other causes. Details of the initiative have not been released. Lisa MacLean, director of the alliance, said in an email the group is “closing in on final policy details this month” and plans to file its initiative early next year. To qualify for the November 2016 ballot, backers would have to gather 246,372 valid signatures from registered voters by July. Steyer, a climate activist, Democratic mega-donor and ally of Gov. Jay Inslee, has played in Washington politics before. In 2014, he donated more than $1 million in an unsuccessful effort to wrest control of the state Senate from the business and oil-industry-backed Republican majority. The alliance’s plan is one of two competing potential 2016 measures aimed at fighting climate change by making fossil fuels more expensive. The other proposal, Initiative 732, would impose a $25-per-ton tax on fossil fuels. It’s similar to a tax that would take a “revenue-neutral” approach, cutting other taxes by an equal amount so that total taxes would stay flat. The plan is based on a similar carbon tax that’s been in place in British Columbia since 2008. Carbon Washington, the group behind I-732, has gathered more than 330,000 signatures. The campaign has raised nearly $700,000, spending much of that on paid signature-gatherers. As an initiative to the Legislature, if I-732 qualifies by the end of the year, it will be sent to the 2016 Legislature for consideration. Lawmakers could then either pass it or send it to the November ballot, possibly with an alternative proposal. By contrast, as an initiative to the people, the Steyer-backed proposal would bypass the Legislature and go straight to the 2016 ballot if it receives enough signatures.